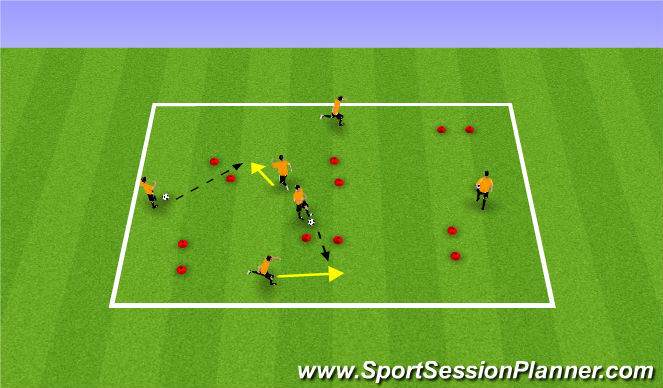 Coaches the objective of this session is to challenge the player in identifying when to pass/when to dribble. 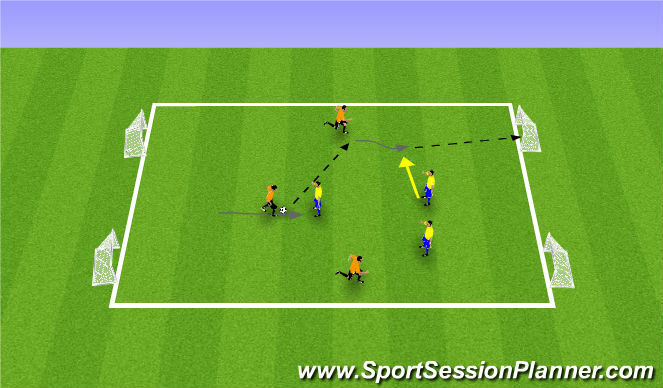 A common issue we are having with youth players is that they&apos;re alway looking to pass when having a teammates involvemen in an exercise. We want to create an environment that will allow for us to help them identify what will influence the decision and teach them the tought process in making decisions that are real to the game. Influences: Where is the opponen, where is my teammate, my capabilities, my teammats capabilities. Supporting player to identify Angle and distane of support. Player on the ball, how to pass/when to pass. Set Up: 30x30 or open space layout cones that will act as gates. Instructions: Divide your group of players in pairs, each pair has 1 ball amongst two or three if un equal numbers. players move dynamically through the area. Player with the ball is looking to make a pass through the gate to their teammate who is receiving the ball on the run. It is vital that the player is receiving the ball across their body as per the diagram. Coaching Points: Passing- Part of foot/part of ball, weight of pass, accuracy of pass, Receiving: part of foot/part of ball, body position, quality of 1st touch, touch direction, choice of foot. Important the players are receiving the ball on their back foot and with the instep. 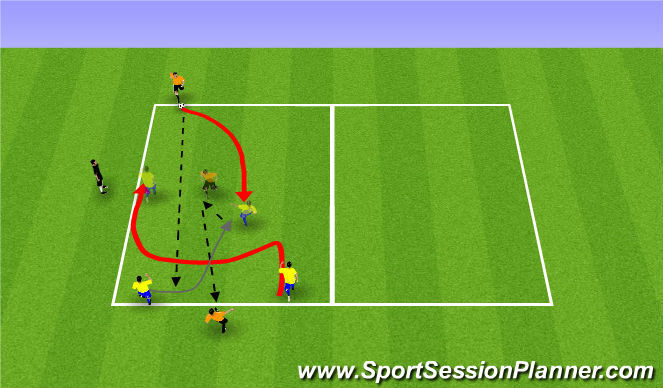 Progression: Provide a time limit and see who can complete most successful passes in aloted amount of time. Set up: 12 x 8, Disc to mark out goal in the game. Balls and bibs. 4 players / area. the attackers has managed to dribble across the goal-line. 3) 1 attacker infringes the rules or the ball runs across any end line. After 10 attacks (5 @ each goal) teams switch roles and positions. The pair to score more wins. Coaching Points: When does the ideal moment arise for passing the ball? When should the ball carrier not pass the ball? What&apos;s the disadvantage of an early pass? why? Where, ideally, should a team-mate receive the ball in relation to the defendar? What is your opinion about the distance of support? Desguise the target of your pass to a teammate. game. Balls and bibs. 4 players / area. opposiing goal-line despite the opponents active defending of it. dribble? Execute faints to beat defender. Support the ball. Defender read opponents, Defend to attack. Quick Transition. Instructions: Players may score by dribbling through any goal. Keep possession if goal is scored. Players cannot attack the same goal twice in succession. Looking at the diagram, R1 has 2 options. 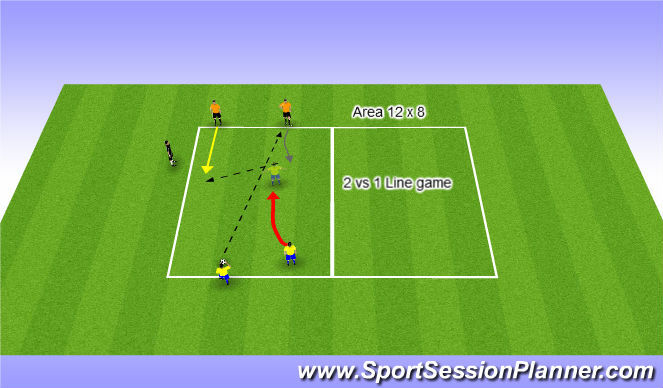 Variation: Line Soccer - attack & defend lines rather than goals.